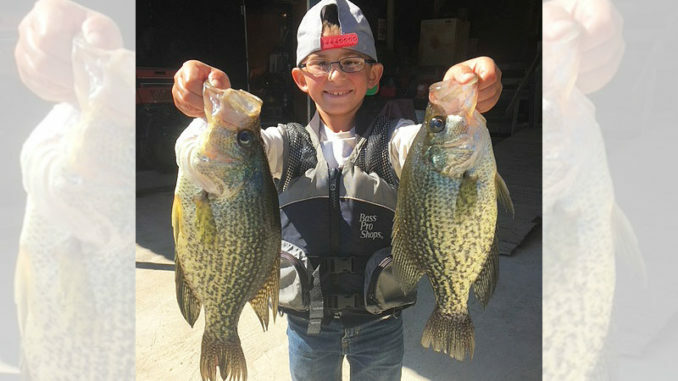 Cayden Meche of Duson, who loves to fish and hunt, shows off two “big hammers” he caught at Henderson Lake. 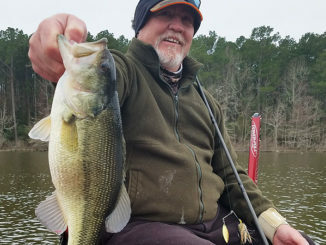 Tie on a red/blue/chartreuse or red/black/chartreuse tube jig or hair jig, fish 2- or 3-feet deep (shallower if the spawn’s still on) and chances are good to tussle with sac-a-lait averaging ½- to ¾-pound at one or more of nine hotspots hand-picked by one of the most experienced anglers on Henderson Lake. That angler is Laurette Mequet of Cecilia, who along with her husband, Mitch, owns Cypress Cove Landing along the West Atchafalaya Basin Protection Levee. Mequet has been fishing the lake in St. Martin Parish since the late 1980s, much of the time by herself, learning when, where and how to put fish in the ice chest. April ought to offer good sac-a-lait fishing success on the lake, she said. How can anglers tell if the fish are spawning still? 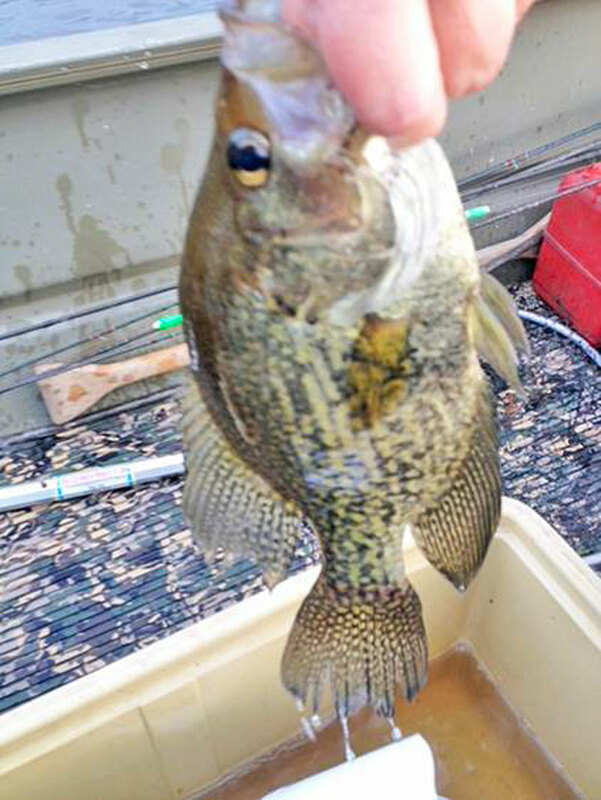 She said the sac-a-lait, particularly the males, are darker, whether they’re black crappie or white crappie. She urged anglers to release females full of eggs. Mequet, a sales associate 17 years at BoatCity USA in Henderson, had a ready list of the prime destinations for April, weather and water conditions permitting. Mequet also favors the Butte La Rose Canal. One of her other top favorites is South Lake Bigeux, where water skiers won’t be out in numbers like they usually are because the water’s still on the cold side. The most consistent pattern there is to pitch the artificials in the flooded woods and work them out. The shoreline is a long one, she noted, and if you fish the length of it you eventually wind up in Pelba Bay. 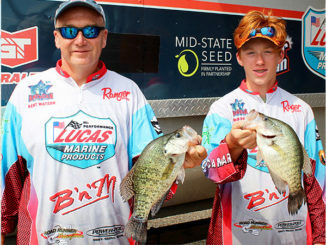 Sac-a-lait anglers who don’t mind getting in the thick of things should do well in Lake Atotoy. 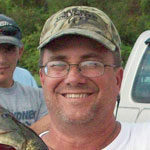 “I also like to fish in Lake Atotoy around the buttonbrush trees, especially if there’s some water lilies around them. That’s good cover for the sac-a-lait. Now … the buttonbrush has a lot of sticks and wood, so it’s easy to get hung up in there,” Mequet said. There are other areas to fish for sac-a-lait, for sure. 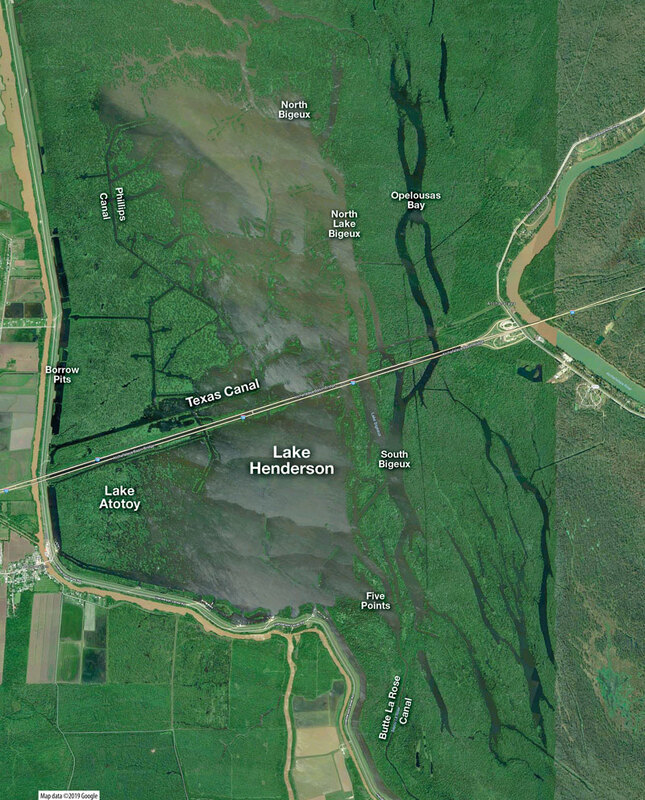 Mequet also pointed anglers to the Phillips Canal area, North Lake Bigeux above Interstate 10, Texas Canal, Opelousas Bay, and Five Points. Fish with 1/48-ounce hair jigs or tube jigs when possible. If the current is strong, use a 1/32-ounce hair jig or tube jig. Overall, she said, Henderson Lake’s sac-a-lait fishing still has its banner days, particularly in April. “You have to fish a little harder for them than you used to. The water stays up more than it used to. And you have to fish a little harder because there’s more fishermen out there,” she said. 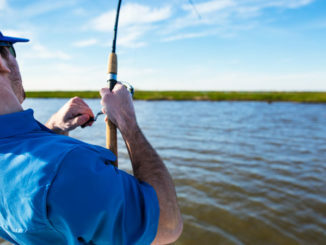 Acadiana’s sac-a-lait fishermen who like a little competition with money on the line are regulars on Wednesdays for the Mequets’ Take Dat Sac-a-lait Fishing Tournament each Wednesday out of Cypress Cove Landing. The entry fee is $35 per boat (two anglers maximum). There is a three-fish limit on sac-a-lait, plus a trash fish pot. A dinner is served at the weigh-in.